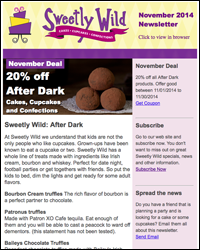 Sign up for the email newsletter and recieve monthly specials on Sweetly Wild treats. Past specials included January's of 20% Off One Dozen Cupcakes or February's of 20% Off After Dark Truffle Combo Pack. The March newsletter had information on nthe new products that Sweetly Wild has to offer. The newsletter also includes news and information on all things Sweetly Wild. Be the first to learn about the latest blog articles. Don't wait. Sign up today. Do you know anyone who would like this newsletter? Let them know that they can save on Sweetly Wild cakes, cupcakes and confections. They will love you for it, or at least think very highly of you.